Today we made snowflakes. 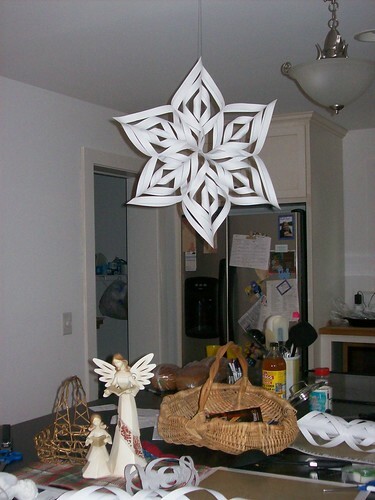 You remember when you were a kid and made snowflakes by folding paper and cutting simple shapes into it? Then you unfolded it, and it became this really cool creation. Well, we did that today. And I really wowed the kids with my snowflake creation. Isn’t it beautiful? And it is so, so easy. Really. You don’t have to be crafty at all to make one and it takes about 15 – 20 minutes if you don’t have kids biting your ankles. Sidney made one all by himself. And Lincoln began one. He’ll finish it later. We used tape on each individual section, but decided to staple when putting the six sections together into one snowflake. Here is the tutorial if anybody is interested in making their own.